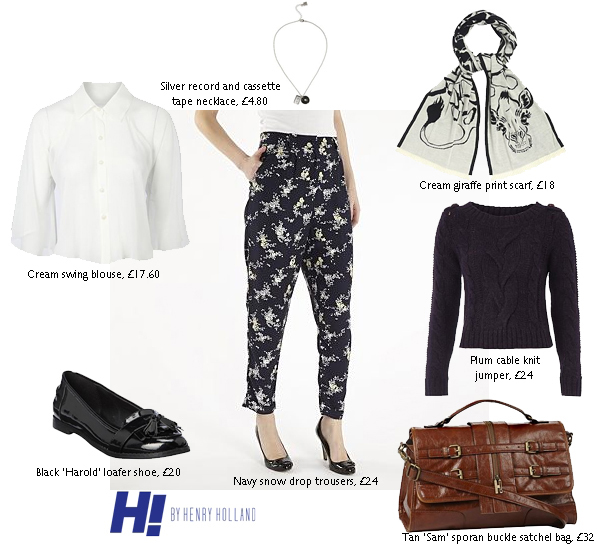 Here are some examples of outfits I would put together from the H! by Henry Holland for Debenhams collection. A lot of these products are reduced at the moment. My favourite outfit is the middle one with the printed high waisted trousers and buttoned up cropped shirt. It is something I could easily wear to go shopping or on a day trip. I love the dress in the third outfit. Mixing velvet and denim is a great idea, reminds me a bit of the 90s though, in a good way! I also like the jeans in the first image, same velvet meets denim idea. ohh i like the loafers! the capey shirty thing in the first pic intrigues me... can't imagine what it'd be like on! and i like the two jumpers as well but they look like they'd be small!! i can't do small jumpers... unless they're meant to be cropped but otherwise, it just annoys me. I love these sets! My favorites are the giraffe scarf and that satchel bag! Great additions to anyone's wardrobe! Oh I do love Henry Holland. Need me some more of his collection! i just came across your blog. I LOVE IT!!!! great taste! love the first swetaer and jeans! !